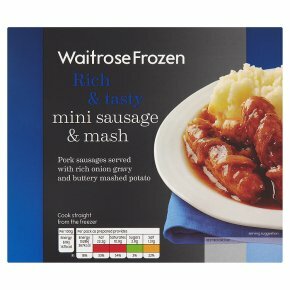 Pork sausages served with rich onion gravy and buttery mashed potato. Cook straight from the freezer. INGREDIENTS: Potato, PORK SAUSAGES (24%) (British pork, rusk (FORTIFIED WHEAT FLOUR (wheat flour, calcium carbonate, iron, niacin, thiamin), water, raising agent (ammonium hydrogen carbonate)), water, pork fat, potato starch, wheat dextrose and maize dextrose, salt, sugar, spices, stabiliser sodium phosphates, Encased in beef collagen casings), water, onions, unsalted butter (milk), tomato purée, FORTIFIED WHEAT FLOUR (wheat flour, calcium carbonate, iron, niacin, thiamin), cornflour, WORCESTER SAUCE (spirit vinegar, sugar, tamarind extract, onion powder, mixed spices, garlic powder, lemon juice from concentrate), rapeseed oil, salt, chicken extract, herbs, barley malt extract, pepper.